Higher National Diploma students entering full honours degree programmes in the final year were among those celebrating their achievements at Uxbridge College’s higher education graduation ceremony at Brunel University. 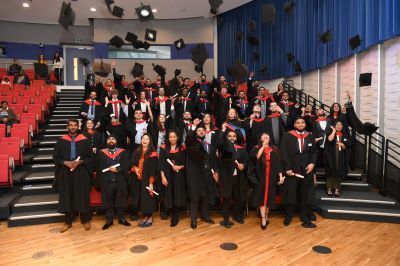 Graduates on HNC and HND qualifications wore traditional cap and gown to officially graduate with their awards presented by Nick Davies, Uxbridge College’s Chair of Governors. Laraine Smith OBE, Principal of Uxbridge College, said: HNDs and HNCs are a fantastic way into a better job or on to a full honours university degree. I feel really proud to see this year’s graduates from Uxbridge College reaping the rewards of their studies in this way. The progression from some of our HND programmes on to a final year top-up degree is becoming an increasingly popular route into university and, yet again, we have dozens of graduates joining a range of universities in the final year including: Birmingham, Sheffield, Reading, Brunel and West London. The BTEC HNC Level 4 and BTEC HND Level 5 Diplomas were completed by 116 Uxbridge College students in the following areas: Business, Computing Plus, Computing and Systems Development, Computing – Games Development, Creative Computing – Games/Visual Effects, Creative Media Moving Image, Electrical and Electronic Engineering, Mechanical Engineering, Sport (Coaching and Development) and Travel and Tourism Management.